We have a commitment with all the people from this Institution and we go beyond academic education. The change on families conception improves development in students giving them a more balanced and confident personality. A team focused on everybody. 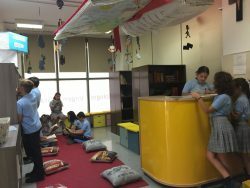 Team coordination inside our classrooms as well as outside our classrooms has been one of the keys of success in our School. In this way we can set up our students profile in a personalized way and it can be seen from multiple perspectives. We count on realistic parents with great expectations towards their children progress avoiding internal conflicts dashing everybodies development. In Virgen de Gracia School we perform multiple activities where parents are involved. They realise what, who, how, when , how much, why and where does their children academic process take place. This is how they can have a whole view about the reality that sorrounds them. Besides working one on one with parents, our professional team shows them their children daily routines. Our team will be always available for a parent conference because a lot of parents want to be informed about their children progress in their developmental stage .